Ageing stocks of bridges require maintenance, in order to prevent breakdown or interrupted service. Such operations require clear prioritisation, in order to make the best use of resources. KEDMOR provides bridge inspection, analysis and maintenance planning. Inspections are carried out according to internationally proven methodologies, adapted where needed to specific local characteristics. Inspections are performed for specific needs as well, such as post-impact damage assessment. Bridge inspections are performed by well-trained and equipped teams. Recommendations are made to optimize the design of the repairs and maintenance. 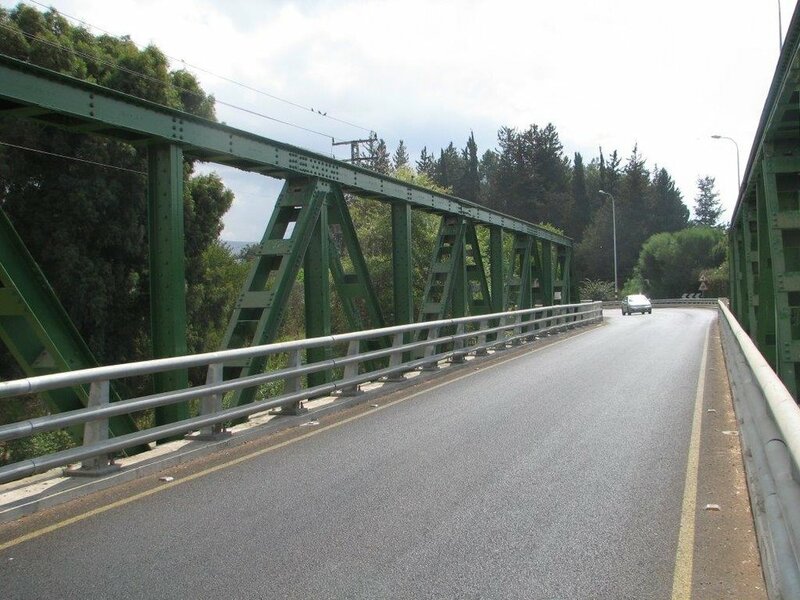 KEDMOR is a pioneer in the field of bridge maintenance and inspection. The segmental 5 span Em HaMoshavit bridge was constructed in 2011. The bridge is located over Route 4 in central Israel. A detailed inspection was performed and reported on in 2017 by our Inspection Team. A steel suspension bridge over the Cross River, located on the border between Cameroon and Nigeria. The bridge was constructed in the beginning of 1951 by a British company. The bridge was inspected by an international team of Kedmor Engineers and Pedelta (Spanish) inspectors. Following the inspection we performed an assessment of the remaining capacity of the bridge and submitted a detailed report to the client. The inspection was done as a part of our consulting services for design of a two-lane bridge over the Cross River at the Cameroon - Nigeria Border (Ekok/Mfum) for the Federal Ministry of Works, Nigeria. The 1950's 'through truss' Yosef Bridge passes over the Arden River in the north of Israel. This project included a detailed visual inspection, combined with dynamic testing and a full load capacity assessment. The bridge was modelled using finite element analysis software and detailed calculations were performed based on the actual results of the inspection and testing. Following the inspection and calculations stage we designed the refurbishment of the bridge. An inspection ofthese communication and antenna towers was performed by Kedmor Engineers in 2016 as a part of consulting services for a government agency, developing an inspection methodology for the evaluation and inspection of these structures.